Cockacoeake’s frontlet, circa 1677, courtesy of the the Pamunkey Museum and Cultural Center. 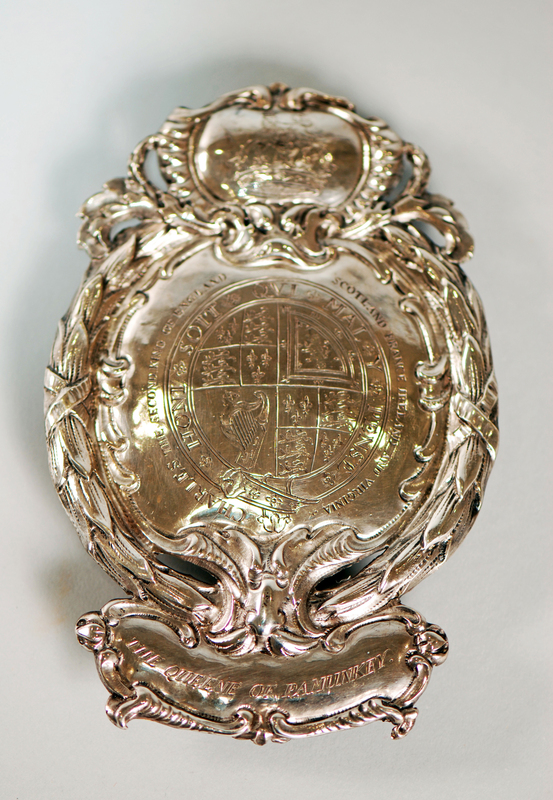 For more than three centuries, one silver object has shimmered as a symbol of peace and power for one of Virginia’s first peoples. Cockacoeske’s frontlet, owned by the Pamunkey Indian Museum and Cultural Center, is on display in the TENACITY: Women in Jamestown and Early Virginia special exhibition at Jamestown Settlement through January 5, 2020. “The first time I saw the frontlet that was given to Cockacoeske, my emotions were so strong, it brought me to tears,” said Debra Martin, councilperson for the Pamunkey Indian Tribe who helped deliver the frontlet to Jamestown Settlement. The bottom of the frontlet features the words, “THE QUEENE OF PAMUNKEY.” The center of the frontlet has the coat of arms of King Charles II surrounded by the words “CHARLES THE SECOND KING OF ENGLAND SCOTLAND FRANCE IRELAND AND VIRGINIA.” The frontlet was given to the powerful Pamunkey chief, Cockacoeske, to commemorate her signing the Treaty of Middle Plantation in Williamsburg in May 1677. In an effort to restore peace between English colonists and Virginia Indians after Bacon’s Rebellion, King Charles II sent commissioners to Virginia to meet with several Indian leaders and broker a treaty. Cockacoeske, who succeeded her husband Totopotomoy as leader of the Pamunkey after his death in 1656, particularly gained the favor of the commissioners. During Bacon’s Rebellion, Cockacoeske met with Governor William Berkeley at Jamestown and agreed to lend him military support against hostile Indians along Virginia’s frontier. Her cooperation with Berkeley, along with the attacks her people endured from Nathaniel Bacon’s followers, gave her considerable leverage in the treaty proceedings. Article XII in the Treaty of Middle Plantation recognized Cockacoeske as the leader of several unspecified Virginia Indian tribes, probably those remaining from the Powhatan paramount chiefdom. By signing the treaty and proclaiming loyalty to the King of England, Cockacoeske and the people she represented were granted several legal protections under Virginia’s Royal government. They could retain title to their lands, continue fishing in Virginia’s waterways, and were protected from enslavement. 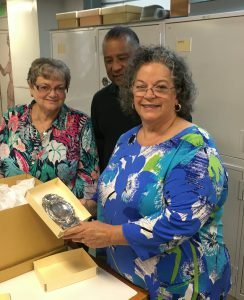 Debra Martin, Councilperson for the Pamunkey, and her husband Sidney, picking up Cockacoeske’s frontlet from Merry Outllaw (left), curator at Jamestown Rediscovery Project, where the object was previously exhibited. In the centuries since the Treaty of Middle Plantation was signed, the Pamunkey Indians have vigorously maintained their sovereignty. Some of the articles stated in the treaty are still in effect even today. The land protected in the treaty became the Pamunkey Indian Reservation in King William County. The Pamunkey further elevated themselves in 2016, becoming the first Virginia Indian tribe to be formally recognized by the United States government. Undoubtedly, the legacy of Cockacoeske lives on, and the frontlet that is on exhibit at Jamestown Settlement is a powerful reminder of her leadership and achievements. Thank you for posting this. Cockacoeske was my tenth great aunt. I live in Charlottesville and I hope to visit Jamestown soon.